The 24-year-old singer announced her pregnancy in June on her website, stating she was "over the moon and very excited." Adele, pictured here with boyfriend Simon Konecki at the 54th Annual Grammy Awards, reportedly gave birth to a baby boy last week. Rumor has it that Adele is now a mommy. According to multiple reports coming out of the U.K., the Grammy-award winning singer and her boyfriend Simon Konecki welcomed a son on Friday. But an Adele rep declined to comment on the birth to NBC News, stating, "We are not releasing a statement at this time. No comment." The 24-year-old singer took to her website in June to announced her preganancy, writing she was "over the moon and very excited" about the news. 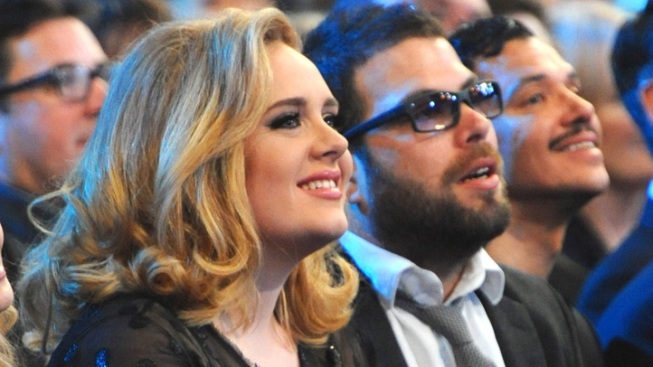 "I'm delighted to announce that Simon and I are expecting our first child together," Adele wrote on her website. This would be Adele's first child and Konecki's second. Konecki, a co-founder of U.K. bottled water charity Life Water, has a daughter from his first marriage, the Huffington Post reported. Adele first met 38-year-old Konecki in summer 2011, and the couple went public with their relationship in January during a trip to the Florida Everglades, NBC reported.